This is a set of tools, methods and works aimed at protecting the enterprise information infrastructure from any external or internal threats that can lead to theft, corruption, or unauthorized changes to data on servers or workstations. Manage mobile devices in your company using MDM solutions. Protection of corporate applications and data in any network, process automation and accurate analytical data. Centralized management of each device, each operating system and every mobile deployment. The main task of DLP systems is to monitor and block attempts to unauthorized transmission of data beyond the permitted perimeter, monitor user actions, record and analyze leakage methods, monitor the implementation of agreed security measures in the organization. 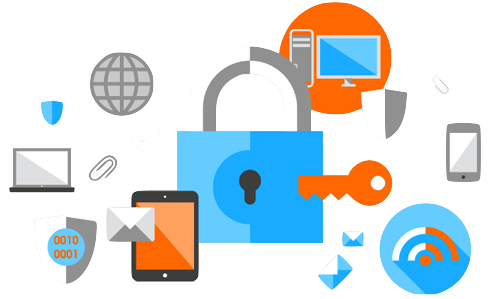 The best anti-virus and anti-spam protection solutions from leading manufacturers for your organization. Web proxy to ensure security and control users' access to the Internet. A comprehensive system of software and hardware systems for detecting and preventing intrusions into the network infrastructure of the organization. The main task is the detection, analysis and prevention of abnormal activity, both within the local network and beyond its perimeter. Today, there are many ways to combat threats to information security. For each threat, their methods and processes are selected, which control certain "nodes" of the information system and prevent any malfunctions in them. However, the maximum effect can be achieved only by applying all these methods in a complex. That is, the design, construction, implementation and support of the information security system is a complex task that requires the analysis of potential threats, the choice of methods to deal with them and the establishment of interaction between these methods. is an effective integrated solution with maximum functionality at minimal costs.